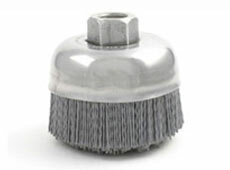 At Brush Research Manufacturing, we know that you need cup brushes for a variety of applications. Whether you need cup brushes for light deburring, edge blending or surface finishing, we have just the right abrasive nylon cup brushes for you. 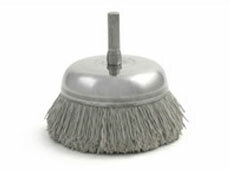 Our brushes also can be used for the removal of rust or paint. Find out more about our selection of cup brushes below, or find out about our filaments on special order. 1-3/4" and 2-3/4" economy cup styles with an integrated 1/4" shaft. 4" and 6" brushes that feature a 5/8" -11 threaded arbor.